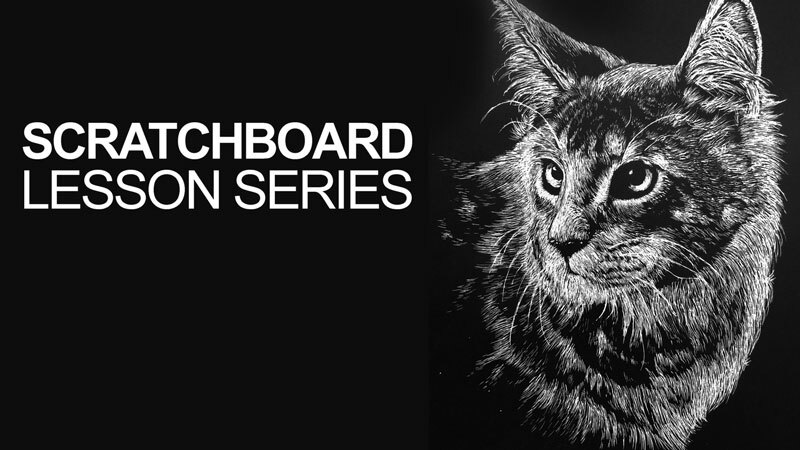 A four-part series on creating a scratchboard image of a cat. Part 1 provides a basic introduction to scratchboard, the thought process, and a look at the tools used by artists. Parts 2-4 walk you through the entire process of scratching away ink to reveal a representational image of a cat. This series includes over 4 hours of video instruction. where do i get this paper and or clay board? You can pick up the scratchboard paper at any art store as well as clay board, if you prefer it. I ordered mine through Amazon – the tools as well. Maybe. Scratchboard is fairly straight forward though. Once you know the process and how to make marks, there’s not much more to it. I need to know how to lay it out so that my students will understand it. I’m not sure what you are asking. In this example, the photo is placed over the scratchboard and transferred with a ball point pen using pressure. The grooves made by the pen serve as the guidelines for the scratching. I just tried to view this video and got a message that it could not be viewed due to it’s security settings. I am a paid member and was logged into the website when I tried to view the lesson.